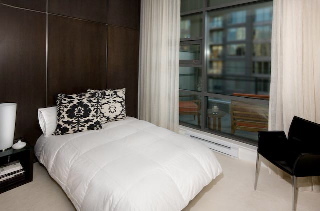 Stay in style in this exclusive, high-end condo located in Vancouver's popular Yaletown district. 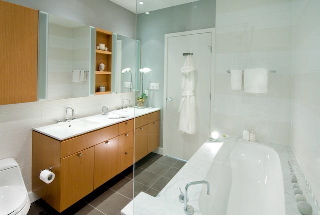 This unit is completely decorated with modern, high-end, contemporary style furnishings. 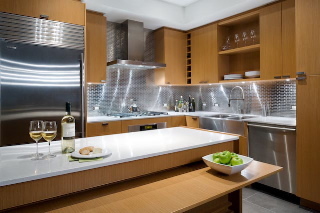 The beautifully designed, fully appointed kitchen comes complete with a gas stove, sub-zero fridge, wine cooler and granite counter tops. 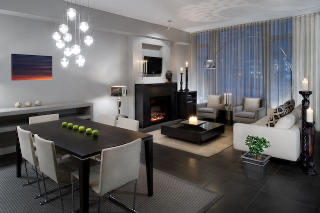 The open concept living area has a sleek design and features an in-suite washer dryer, LCD TV and electric fireplace to warm up by. An extremely unique feature is the large living room window, which is actually a retractable glass garage-door that looks out to views of the adjacent dog park and downtown city lights. Each bedroom has a unique look and both are equally elegant. The master bedroom has a balcony with a propane BBQ. 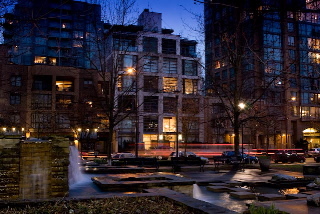 Yaletown offers trendy shops, services and restaurants that are mere steps away from the building. The condo is also located just blocks away from GM Place and BC Place, which are keys venues for the Olympic ice events including hockey and figure skating. 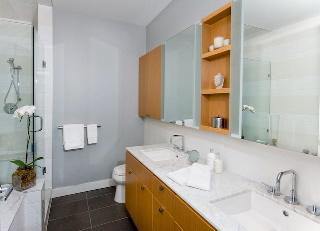 This condo is the perfect executive style condo for you and your friends and family to enjoy all that Vancouver has to offer. Living room has a single sofa bed.